This entry was posted in Bliss Tips, Child's perspective, Children's Art, Children's Writing, Kids Art and tagged Children's Art, children's writing, Drawing, dry-erase, Family, golden retriever, Grandchildren, Grandma and Grandpa, Sneaking Bliss by MaryALivingston. Bookmark the permalink. 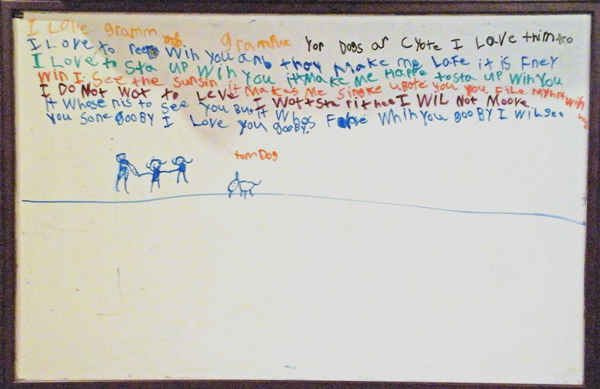 In the days and weeks, after my first fire chiefs death, there was a note written on the dry erase board, at our firehall. Written in blue marker…is the words “I miss my grandpa.” This was …..about 7 or 8 years ago. Though notes may come and go, on that board, those words remain untouched, and bring back memories of Chief Jordan, every time I’m at our firehall. So if kept out of harms reach…..I believe in leaving it as is! A visual image says a thousand words. Chris, that is so touching. We are such sentimental creatures, searching for ways to hold on to that which inspires and gives hope. Thanks, and thanks for the suggestion. I will give it a try on a test board. It is hard when the grandkids are far away, we video chat with ours when we can.